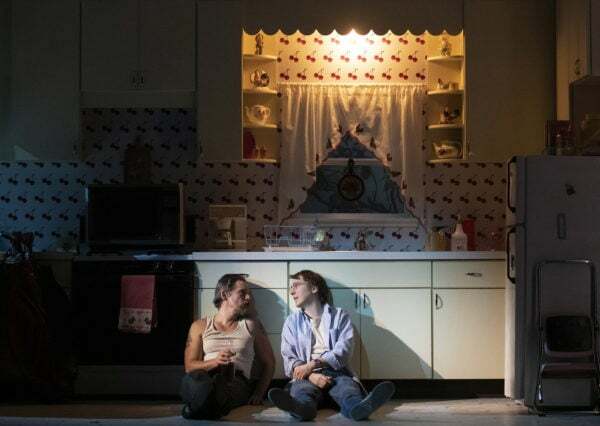 The smell of toxic masculinity wafts through the American Airlines Theatre, where Roundabout Theatre Company presents a revival of Sam Shepard’s magnum opus True West. But don’t mistake this production, directed by James Macdonald and starring Ethan Hawke and Paul Dano, for a celebration of fragile male ego and the wanton, thoughtless destruction that so often follows. More than perhaps any other SWM playwright of his generation, Shepard sought to chip away at the sacred cows of manhood, and the current revival honors that intent. First staged in 1979, True West remains a pulse-pounding exploration of tropes of American manhood, sibling rivalry, and the vaunted frontier that so occupied Shepard, right up until his death in 2017. The bait-and-switch executed between the two central characters — uptight screenwriter Austin (Dano) and unctuous drifter Lee (Hawke) — can be intellectually reasoned as a war between id and ego, a battle between the ever-present human desires for security and excitement. Each brother fits nicely in his assigned role, but he can’t help wanting to feel the grass on the other side of the fence. Yet Shepard didn’t write an academic exercise. He blended elements of farce, boulevard comedy, and absurdism into his indictment of traditional American values, and the result is a rollicking good time. Macdonald understands these disparate strands of storytelling, which manifest themselves in a pleasingly self-aware physical production. Mimi Lien’s kitchen set has a veneer of unreality about it, as though it were a soundstage; this nods to Austin’s profession, as well as both brothers’ obsessions with California film culture. Jane Cox’s lighting design suggests how little the passage of time matters. The impossibly bright mornings turn reliably turn into dark suburban nights, as Lee and Austin hammer away at their work — and at each other. The kitchen becomes the stage where the men act out their deepest desires. Austin puts down his family-man mantle to momentarily become a small-time crook, pinching every toaster oven in the neighborhood. (Lien clearly had some fun with this assignment). Tired of his squirrely weirdo status, Lee finds that adopting the respectable patina of a Hollywood writer is much easier than anyone might expect. This is the West, after all; even in the suburban sprawl of the 1970s, it was still a place for reinvention. But no matter how they reinvent themselves — as a professional, a criminal, a drifter, a father — the play and production never lose sight of the fact that Lee and Austin are performing manhood. Sometimes the manhood is self-sanctioned; at other points, it’s societally approved. Macdonald guides Hawke and Dano to moments in which they gain awareness of this façade and how it affects every aspect of their personae and their lives. Lee’s braggadocios talk about time spent in the desert sounds just like that: bragging. Hawke and Dano convince as brothers, building decades of unspoken transgressions and grievances into their rapport. Both give expertly realized performances, although Hawke seems more comfortable with the overall character transition than Dano, who sometimes comes across like a good little boy playing the bad guy in a childhood game. Still, there’s a winning earnestness in his style of acting that suits the amenable, impressionable Austin. Gary Wilmes makes a slippery Saul, the louche movie producer whose loyalty vacillates between Austin and Lee; he cuts a slick figure in Kaye Voyce’s leisure suits. Only Marylouise Burke seems miscast in the tricky role of Mom, who returns from an Alaska vacation to find her house destroyed and her sons destroying each other. Burke has no trouble handling the part’s humor — as when she tells her boys they have “the whole outdoors to fight in” — but she often leans too far into that element, neglecting the subtle darkness at the character’s edges. Mom is the progenitor of this disturbed duo, after all, and should come across similarly troubled. Forty years after its premiere, True West still has a lot to say about how individual and collective identities are formed. Shepard’s battling brothers may end up ransacking your house, but you still can’t help wanting to invite them in.